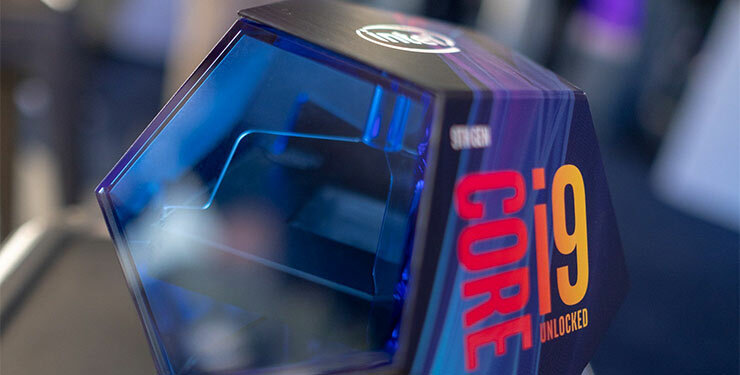 When Intel released the Core i9 9900K, the entire PC industry rejoiced because this was the first time Intel decided to go beyond their usual route and release their first mainstream, eight-core processor. Needless to say, it was met with a positive response across the board, and critics and users loved it alike. However, in order to run such a monster of a processor, you need a motherboard that was stable enough. This is where the Intel’s Z390 chipset came into play. It was tailor-made for those who were looking for a great experience with the processor, and Intel was there to get the job done. Now when it comes to the Z390 chipsets, the market is flooded with them. You will find some great options and some not so great options. To deal with that situation and to help the readers pick the best possible motherboard, we are going to be looking at the best motherboards for Core i9 9900K. These motherboards are handpicked and will offer great performance regardless of what you are looking to achieve. Whether you are an extreme overclocker, or you just want a motherboard that looks and performs well. The list has you covered. Asus’ ROG series happens to be one of the best when it comes to performance and features. For the longest time, they have been delivering some serious performance chops, and the best part is that that they are doing so without really complicating things for the users. Today, we are reviewing the ASUS ROG Maximus XI, Asus’ flagship motherboard from the ROG lineup. Is it good or is it the best motherboard for your Core i9 9900K? Let’s find out. Right out of the box, the motherboard has enough features to make you drool. The dedicated VRM water cooling block is something that most people would love and will allow you to push your clocks even further than you normally would. The XI Formula is also one of the first motherboards shipping with the Aquantia 5Gbit NBase-T LAN controller. This means that when the 5G network does come commercially, the motherboard will have fully support it. The overall design language of the motherboard is solid, and it is filled with all sorts of extras, as well as an amazing array of fan headers, and other connectors. Honestly, as far as the downsides are concerned, I do not think that there is a single thing that can hold this motherboard back. You get amazing performance through and through, and the best part is that it looks gorgeous while doing so. 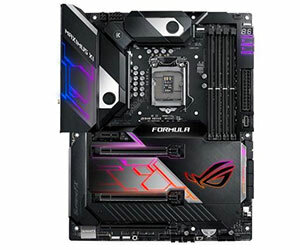 In conclusion, the ASUS ROG Maximus XI Formula is the perfect motherboard for anyone who is looking to buy a great motherboard for their Core i9 9900K. Sure, it is a bit expensive, but that does not mean that it is not worth every penny. Plenty of connectors that you can use. Asus’ amazing bios and software combination are amazing. Comes with 5G network support. If you are looking for an extreme overclocking motherboard that is made with performance in mind, then the chance of you finding something really high end from MSI’s camp is high. MSI is a company that prides itself in giving something for everyone. However, you cannot just grab any random motherboard and pair it with the might 9900K. That is we are looking at the MSI MEG Z390 GODLIKE. MSI’s top of the line motherboard that wants to deliver performance, looks, and extreme stability. If you are looking for a motherboard that does not just look good but performs like a champion, then there is no denying that the Godlike is something that you must look into. The overclocking potential on this motherboard is top tier and should give you absolutely no instabilities whatsoever. As a matter of fact, it is one of the most stable motherboards that you can find in the market. Tin terms of features, the motherboard does not hold back at all. There are so many features that you can get lost finding the ones that you want to use. Thankfully, all of them are extremely useful. Additionally, I love how MSI’s implemented the RGB LED system on this motherboard. It is one of the most cohesive, and advanced form of RGB lighting that we have had the chance to see. As far as the downsides are concerned, my only issue with the motherboard is that the overall storage performance is not on par with the industry standards. Overall, we can say with conviction that the MSI MEG Z390 GODLIKE is the best MSI motherboard available in the market. It offers top of the line performance, and the best part is that it pairs with a core i9 9900K in a perfect manner. So much so that you will not run into any issues whatsoever. The storage performance could have been better. 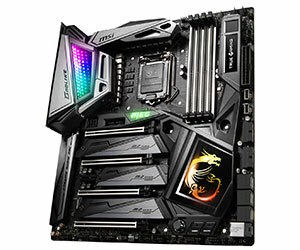 Let’s not forget that Gigabyte has been providing us with some great motherboard options for some time now. Not just motherboards, they have some great options when you look at graphics cards as well. So, it is only fair that we take them seriously when looking at their product. Today, we are reviewing the GIGABYTE Z390 AORUS XTREME. Gigabyte’s top-tier motherboard that comes with some serious performance chop and a price to match. Is worth the price? That is exactly what we are going to be looking at. For starters, the motherboard comes with a pretty large voltage regulator module. This is great because if you are looking for the additional performance, you can certainly get it from the motherboard. The larger VRM does help with stable overclocks, and stable power output as well. The motherboard also gives us access to the latest Thunderbolt 3 standard and has two USB Type-C ports. For the networking enthusiasts, there is a dual 10GbE as well as a GbE and 1.73 gigabits per second Wi-Fi. The Aorus RGB Fan center is amazing and offers you eight RGB/D-LED/fan ports. The OC touch controller has additional fan ports that you can use. As far as the downsides are concerned, my only gripe with this motherboard is that Gigabyte did not include any mounting hardware for the touch OC panel. So, you will have to arrange that yourself. 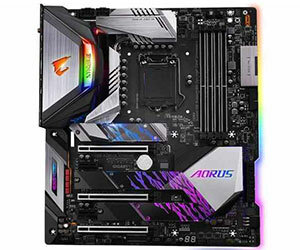 In conclusion, the one thing that we are sure of is that the GIGABYTE Z390 AORUS XTREME is definitely one of the best motherboards for your Core i9 9900K. It will give you top tier performance without many issues in the way. Large VRM means increased power output and stability. You get Thunderbolt 3 with dual type-C ports. You also have a 10GbE as well as a 1.73 gigabit per second Wi-Fi. The Aorus RGB fan center is a dream come true for RGB lovers. The OC touch panel is great to use and has additional fan headers. The thing we really love about Asus is how their products range in such a way that there is something for everyone. This is something that many companies fail to achieve, but Asus does so in a wonderful way. They have a strong portfolio of some amazing motherboards available in the market. Today, we look at the Asus ROG MAXIMUS XI APEX; now before we proceed, it is important to know that this motherboard caters to those who are looking for an option that gives them extreme overclocking prowess. How well does it hold up? Let’s find out. You get 8 phases and 16 power stages for overclocking, it uses high-quality components that are built for overclocking, and the single DIMM channel makes sure there is a lot more stable memory OCing. You have features for liquid nitrogen cooling option available as well. The overall PCB overlay is simplified and works really, really well. There are a plethora of options related to troubleshooting, and the motherboard looks epic with a solid design. As far as the downsides are concerned, I could not find any issues that might be a problem. However, I would tell you that this motherboard is specifically made for people who are looking to overclock their CPUs. Outside of that, spending your money on this motherboard might not be the wisest of decisions. 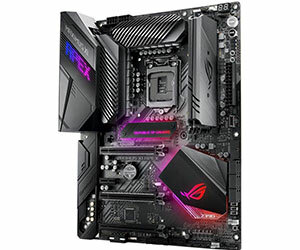 Overall, the Asus ROG MAXIMUS XI APEX is one of the best motherboards in the market, made specifically for the overclockers who are looking to get the best possible scores they can. Comes with extreme overclocking options. 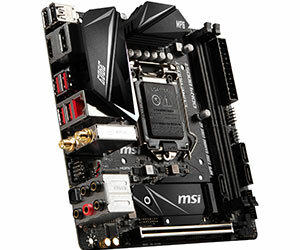 The last motherboard we are looking at is from MSI. We felt that it would only be fair that we include something different. If you are wondering how this option is any different from the rest of the motherboards that we have included. Well, this one is a mini-ITX option for your Core i9 9900K. We are looking at the MSI MPG Z390I GAMING EDGE AC. One of the best mini-ITX motherboards available in the market that offers great performance and looks amazing as well. How well does it fit in the list, let’s dive in and find out? For starters, this is one of the prettiest motherboards I have had the chance to look at. Seriously, I don’t know if I have seen a motherboard that looks this good. The color scheme, the lighting implementation, as well as everything else in between looks absolutely amazing. The audio implementation on this motherboard is also one of the best, and the motherboard posts solid, and satisfying results as far as the audio is concerned. I can assure you that you will have nothing to complain about as far as the audio is concerned. You also get the Intel network controller, which happens to be among the best we have seen in any motherboard this small. As far as the downsides are concerned, my biggest issue with this motherboard comes from the fact that there are not many USB ports on the rear. You only get a total of 5 USB ports, which might not be enough for many people. So, that is one thing that you must keep in mind. Overall, the MSI MPG Z390I GAMING EDGE AC is one of the greatest motherboards that you can find in the market. It is great when it comes to the price, and the performance is pretty great. I really do not think there are any major issues that can hold the overall experience back. Not a lot of USB ports. The thing that you must know about the Core i9 9900K is that it is one powerful processor. The most powerful mainstream processor, as a matter of fact. So, when it comes to finding something that is stable and powerful enough, you are going to need the right motherboard that goes with it. That is why in this list, we have only included motherboards that deliver enough power for the might core i9 9900K. So there are no performance discrepancies whatsoever that can be an issue for most people. We can assure you that if you are looking for good performance, this is the way to go.